This is a complete used kit with tap, remaining helicoils and installer tool. There are two things that are special about this kit that make it better than a retail tool for fixing a stripped out head bolt hole in an aluminum block such as on a Honda Accord or Civic engine. First, it comes with a socket welded to the the tap as seen on the right hand side of the picture. Head bolt hole threads frequently do not come to the surface of the deck and are recessed quite a bit. Unfortunately, this means that the tap won't reach to the bottom of the bolt hole if not extended. This custom tool allows the whole hole to be tapped out. It also comes with the correct 31/64 drill bit which usually must be purchased separately! The kit comes with three new coils and a fourth which is bent but might be made usable. 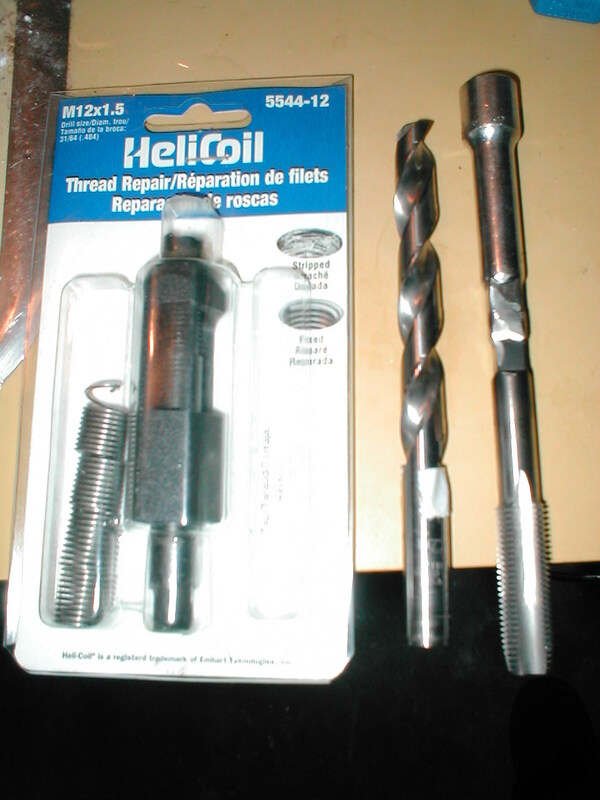 The coils themselves are quite cheap, it is the drill bit and custom tool that are harder to find.